For nearly a decade, comedian Chris Gethard has been doing weird, no-budget TV stuff for a small-yet-dedicated audience, but now TruTV’s The Chris Gethard Show is coming to an end. Gethard made the announcement himself in a lengthy Facebook post (seriously, it’s so long that you’ll have to click the link to read the whole thing), in which he explains that this was sort of a mutual decision between him and the higher-ups at TruTV. He proudly admits that The Chris Gethard Show was “the lowest rated show on the network,” so TruTV probably would’ve enforced some kind of retooling if it had continued, but Gethard figured that it would make more sense to just wrap up the show. 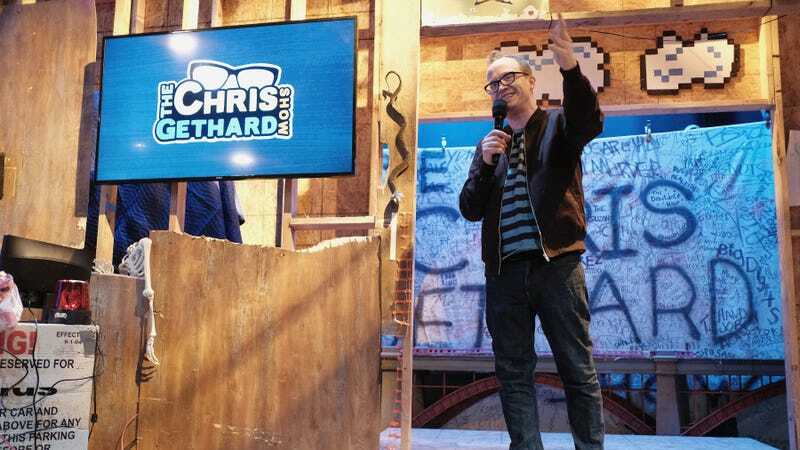 After the dramatic announcement, the Facebook post turns into the sort of heartfelt introspection that we’ve come to expect from Gethard, and it touches on his feelings about “pushing 40" and “evolving” as a person while The Chris Gethard Show struggled to evolve with him. He also thanks his crew, the show’s fans, and the various networks—Comedy Central, Fusion, and TruTV—that had a hand in keeping the show alive, and he mentions that there was only one episode in the show’s entire cable run where he and the crew “kicked and screamed” for the network (Fusion at the time) to let them do it their way without any notes. That episode was “One Man’s Trash,” which you can watch below.